Wide format print is often associated with display graphics and signage – large posters and banners commonly seen in places like theaters, airports, and retail stores. However, advancements in technology and print have greatly expanded the capabilities of wide format and Suttle-Straus is excited to provide clients many new opportunities. Our wide format production features sheet and continuous-feed presses capable of printing up to 126 inches wide and on substrates up to two inches thick. With substrates ranging from vinyl to ceramic, plastic to carpet and wood to canvas, the possibilities are endless. 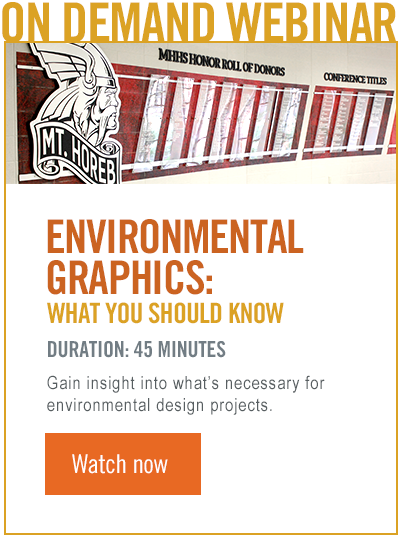 The variety of print options and the work of our dedicated engineering team, allows us to also produce captivating environmental graphics for commercial, retail, or hospitality spaces. Through color, imagery, form, and typography, we help create striking environments that communicate and engage with visitors. From point-of-purchase displays to banners and signs, our team works collaboratively with customers to deliver exceptional products that will get noticed. Through color, imagery, form and typography, we help create striking environmental graphics that communicate and engage with audiences. Thinking outside the box delivers impressive results. Our team enjoys working on special request projects and creating unique "wow" pieces. Our large format production includes sheet and continuous-feed presses capable of printing up to 126 inches wide and on substrates as thick as two inches. Slicing, cutting, routing or chopping are done quickly and efficiently with out the need for die-cutting. Authenticate the look of your message with a substrate that gives your pieces the added layer of texture and interest. Need to go beyond viusals to reach those with vision impairments? Our braille service can bring your message to those in need of an alternative solution. Exciting new color capabiliites allow us to layer colors, apply brightness and color to dark surfaces, and develop eye-popping images that stick out to consumers.